Incidents in your VictorOps timeline function like a simple table with two columns: the field name, and the value of that field. Field names are either predefined automatically by VictorOps, defined by the integrated monitoring tool or created by a Transmogrifier rule. This makes an exhaustive list of all potential fields nearly impossible. However, certain fields are always present, and this article defines and explains those fields, how their values affect the behavior of an incident, and how the Transmogrifier can be used to manipulate those fields. The message_type field is the one required field in VictorOps (all other fields would be filled in automatically). message_type is used to determine the behavior of the alert when it arrives. CRITICAL – Opens a new incident, which will set off an escalation policy and result in users being paged. WARNING – May open a new incident depending on configuration in Settings>>Alert Behavior>>Configure Incidents>>”Create incidents for entities in [xxxxxxx] state”. Otherwise, it will post information to the timeline without creating an incident or triggering any escalation policies. This field serves as the central identity of an incident. It is used to recognize related events and must remain consistent throughout the life-cycle of the incident. 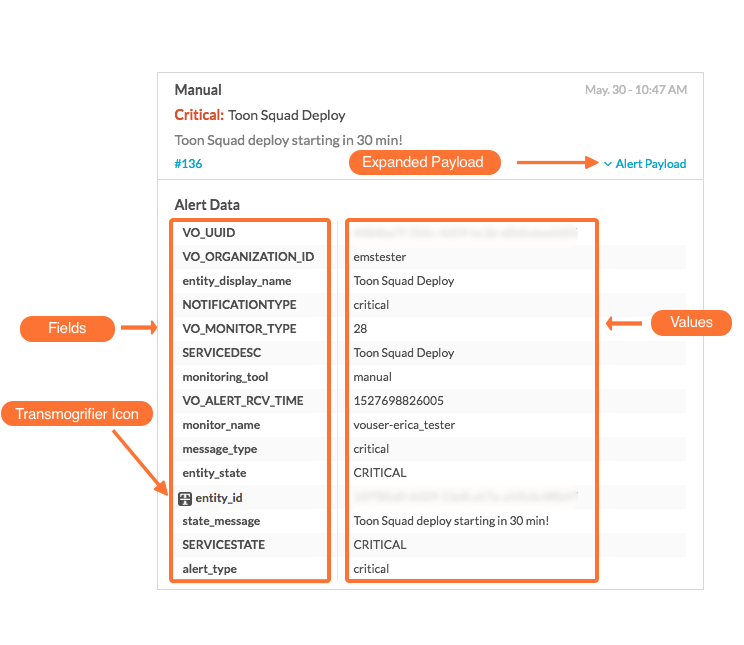 This field is how the VictorOps platform knows that a particular recovery message applies to a particular open incident. When an incident is unresolved (in a triggered or acknowledged state), and another critical message arrives with the same entity_id, the new message will be rolled up into the existing incident without creating a new incident. This works great for preventing duplicate notifications for the same problem, but users must also be careful not to leave an incident unresolved for too long or they risk missing a separate occurrence of the same problem. If not provided, this field will be auto-filled with a random String value. This field controls the routing of incidents to specific teams. Routing keys can be created and assigned to a team, or teams, at the bottom of the Settings>>Integrations page. An incident can only have one single routing_key associated with it. Often times, the entity_id of an incident can be long and full of jargon. Setting the entity_display_name will change how the incident appears in the timeline because it is the serves as the title of the incident. This field is also read aloud during phone call notifications, which gives users an opportunity to simplify and customize the message without affecting the life-cycle of the incident. The state_message field is meant to contain a more verbose description of the problem. It can also contain URL links. When using an email endpoint integration, the body of the email will become the state_message field. Users can add as many custom fields (with custom names) to an incident as they wish. This can be done by manually adding the fields to the HTTP POST request, or by using the Transmogrifier to create a new field. ack_author Username Displays the user who has acknowledged this incident. entity_display_name Any More succinct, intuitive name for incident that does not affect the entity_id. Defaults to entity_id if not explicitly defined. *This field is read aloud during phone call notifications. state_message Any Large field used for passing verbose information about the incident.